Inviting sun porch with dining table, ample seating and cable TV. Living room with conversational seating and cable TV. Spacious dining room with seating for 6. Open floor plan with brand new kitchen. 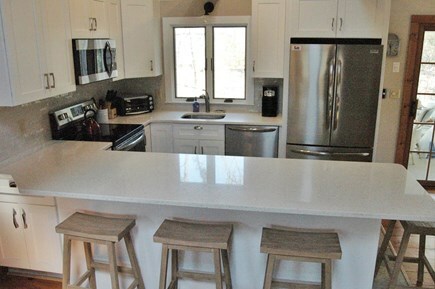 Stainless steel appliances and quartz counter top. 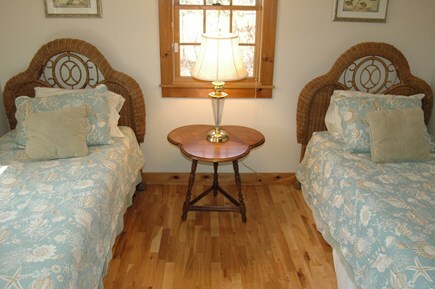 Downstairs bedroom with 2 twin beds. 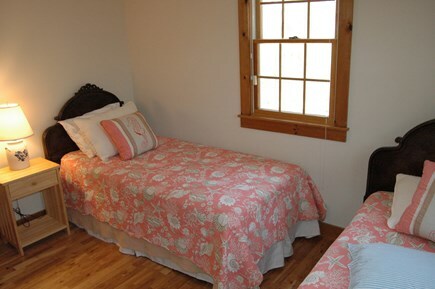 Second downstairs bedroom with 2 twin beds. 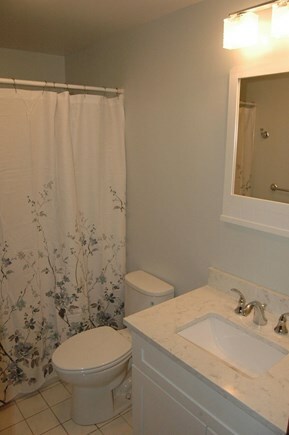 Downstairs bathroom, New toilet and vanity. Walk-in shower. 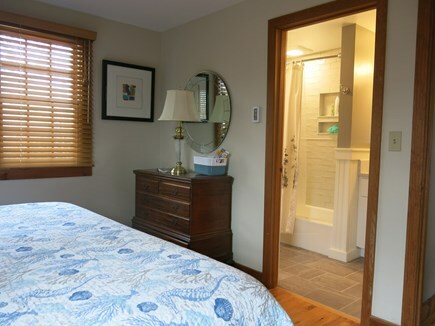 Upstairs master bedroom with full bath. New window treatments and king size bed in master bedroom. 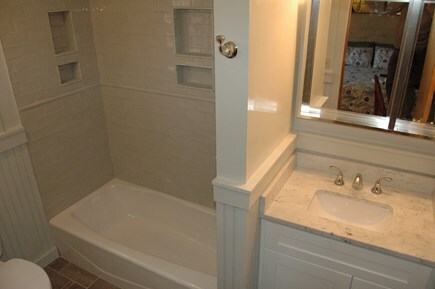 Fully renovated master bath with tub and shower head. Surf and sand! Nearby ocean, bay and pond beaches! Biking Family Fun! Easy access to the bike path. This fully renovated and inviting, 3 bedroom home on a private cul-de-sac is awaiting your arrival. 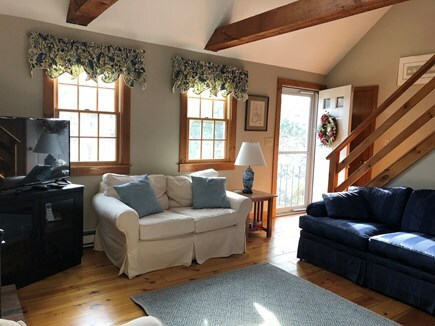 Recent updates include: a brand new kitchen with stainless appliances and counter seating for 4; a newly remodeled master bath with tub and soaker showerhead; and, an updated 1st floor bath. 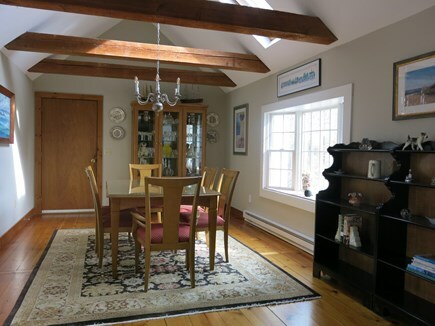 Enjoy your morning coffee or evening sunset in a light and airy sunroom. Outdoor seating available for 6 and new gas grill for your enjoyment. 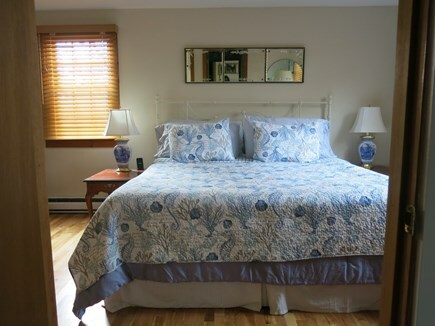 Other amenities include a dishwasher, washer/dryer, cable TV, and Internet. 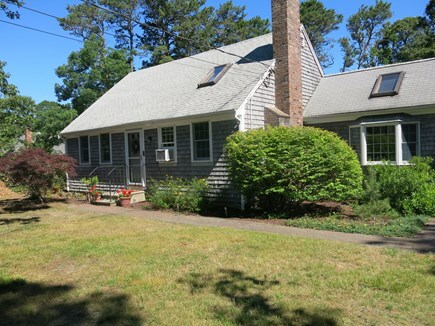 First Encounter, Nauset Light and Coast Guard beaches are a convenient 2 miles away, while Great Pond, a freshwater pond, is just a mile down the road. 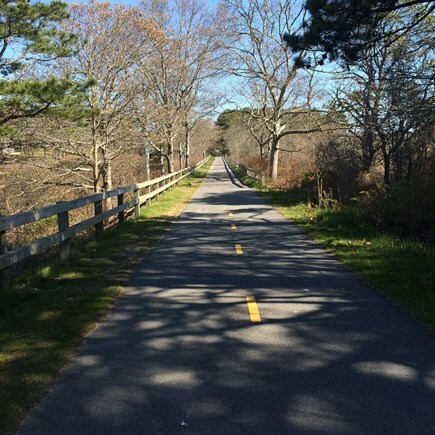 Easy access to the Cape Cod Bike Trail adds to the family summer fun. Other activities include miniature golf, go-carts, kayaking, hiking, whale-watching or hopping on the Hyannis ferry for a day’s trip to Nantucket or Martha’s Vineyard. You’ll have your pick of family friendly or fine dining close by. If you like antiquing, art, pottery or interesting shopping, head to nearby Orleans, Brewster and Chatham or Welfleet and Provincetown. I have been spending summers and holidays on the Cape since childhood. I inherited my grandmother's home in Eastham and feel so proud and happy to be able to carry on the family tradition. Visitors and locals alike all marvel at the Cape's natural beauty. 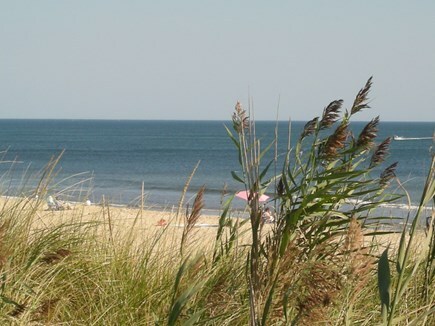 There are so many wonderful places to visit: from the natural woodlands habitat preserved at Nickerson's Park in Brewster, to the walking trails through the dunes of Truro, or the miles of pristine coastal beaches, part of Cape Cod's National Seashore, beauty abounds! It's a perfect environment for families where children, as often do, become mesmerized by water and sand, giving weary parents a time to relax from the stresses of day-to-day responsibilities. Our home is located at the end of a quiet street. Houses sit on a half acre of property, providing privacy and serenity. 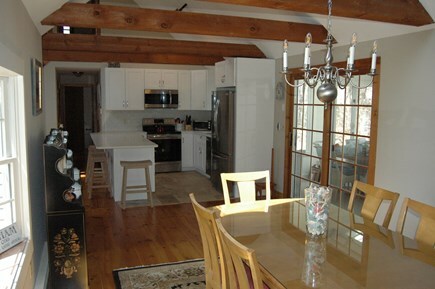 Two important features of our home would be the kitchen and sun porch. We love to cook, so having a well-equipped kitchen is important to us. While the kitchen is the focal point of the home, there are places for one to go to relax. 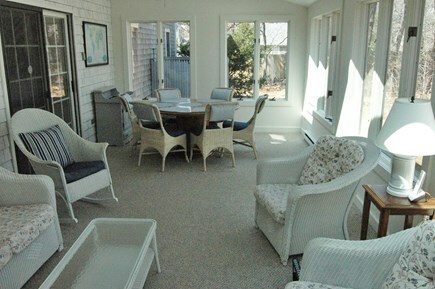 Family members can retreat to the sun porch to watch TV. If you are eager to unplug, it’s a perfect place to chat, read, play cards or board games. There is an ideal water and sand environment to satisfy diverse personal taste. If you want waves, high or low tide, or the calm and reassuring lapping of pond water - it's at your finger tips. The bike path is another advantage. Bike rentals shops are many and located in close proximity to the trail. If you bring your own bikes, there is no need to load them onto the back of your car. Your bike can take you to Orleans, Welfleet, the ocean, the pond or the bay. Family fun is very close by: miniature golf, Willy's gym where they have a great indoor climbing wall, Arnold's, Hole in One, and the movie theater in Welfleet are favorite attractions. Nearby Orleans boast a bowling alley with the best barbecue on the Cape. Get there early because the parking lot is always full!